Andrew Elliott was a former member of the society who lived in Reading up to his retirement when he moved to a lovely location on the north bank of the Ribble estuary at Warton. There he attended the Blackpool & District Astronomical Society. He did many talks to astronomy societies all over the UK, about his consuming interest of high-speed imaging of meteors and digitally-timed recordings of occultations. Following the untimely death of Andrew on 28 Nov 2010 and having been honoured by the IAU in naming asteroid 229255 Andrewelliott, Chris Menmuir and Gerry Bond from Reading attended the BADAS meeting of 3rd Aug 2011. Some of Andrew’s videos and results were shown, and talk about the man himself and how he inspired so many. 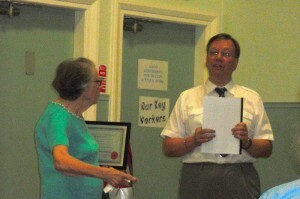 Edna Elliott, Andrew’s mother, was guest of honour. This entry was posted by jtalbot on August 9, 2011 at 14:47, and is filed under News. Follow any responses to this post through RSS 2.0.You can leave a response or trackback from your own site.